An uncommon fine grained highly plastic clay mineral related to bentonite. Named after Hector, CA. From volcanic sources. Bentone (AKA Macaloid) is a super plastic additive used to modify rheolgy in many consumer products. It is made by refining Hectorite. 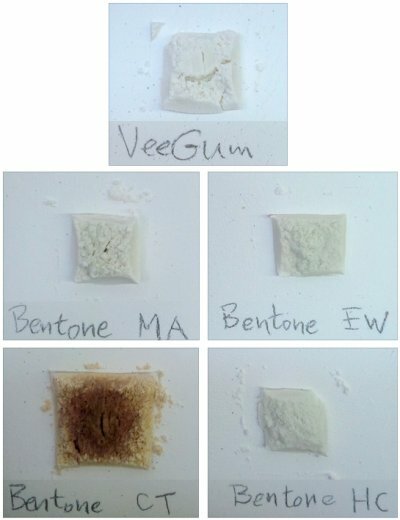 It is very difficult to mix pure Bentone with water, it is just so sticky and the water content is so high, it takes a week to dry a sample and it cracks into pieces during drying. I am studying five different grades for use as a plasticizer in premium porcelains. I am interested in how they stack up against the king: VeeGum T (both in price and performance). The first step was to fire square tiles of the powder on small porcelain tiles at cone 6 to compare the iron content. Three sintered into a solid mass, shrinking to about half the size. The CT grade is the natural, untreated Hectorite clay (accounting for its darker color), the processing to purify the material obviously increases its affinity for water, shrinkage and fired maturity.